AN ACADEMIC WHO wrote a damning report of practices by gardaí and Tusla in its child protection services has been asked by the force to train new recruits in child protection. Geoffrey Shannon’s report was sparked by the controversy surrounding the removal of two Roma children from their parents in Tallaght and Athlone in 2013. Speaking to an Oireachtas Commttee this week, Shannon reiterated his findings to TDs and answered questions on the progress made on his recommendations to date. He was originally tasked by the garda commissioner to review the use of Section 12 powers. Section 12 of the Child Care Act of 1991 enables members of the force to take a child into their care if they believe their safety or welfare is at risk in their current situation. In the report, he highlighted how a lot of training done by gardaí in child protection was done “on the job”. Although he again praised the conduct of rank-and-file members of An Garda Síochána to Oireachtas Committee members, he also recommended that specialist training is given to all gardaí in how to deal with child protection cases and to understand their Section 12 powers. Shannon said: “It is important we train our gardaí and that this training does not stop once they leave Templemore. 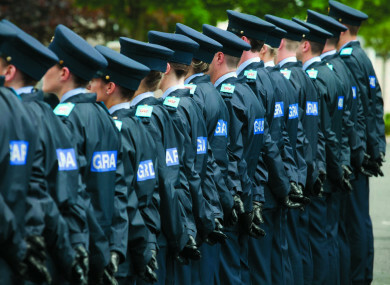 My vision for a force that exercises such exceptional powers is that there should be mandatory continuing professional development for members of An Garda Síochána. The legislative landscape is changing dramatically. Accordingly, we must ensure that members of An Garda Síochána understand these new powers and responsibilities imposed upon them. That can only be achieved through training. In a statement to TheJournal.ie, a garda spokesperson said that it accepted all the recommendations made by Shannon and had already taken steps to address the issue of training. The gardaí have asked Shannon to train new recruits in child protection best practice in the future. The spokesperson said: “An Garda Síochána has also engaged with Professor Shannon on a number of occasions in relation to implementation. An Garda Síochána has extended an invitation, which has been accepted, for Professor Shannon to assist and participate in future child protection training for Garda members. An Garda Síochána is extremely grateful to Professor Shannon for his assistance in this regard. A number of TDs on the Justice Committee spoke very forcefully against the conduct of the gardaí and Tusla while questioning Shannon. Independents4Change TD Clare Daly likened the situation as outlined by Shannon to other controversies within An Garda Síochána. She said: “I was struck by the similarities in some of the points regarding training and Pulse with what gets the headlines for the garda, such as breath tests. We have seen the headlines about how inadequate Pulse is, but this is child protection which in many ways is even more serious. One of the main criticisms in the report is of inter-agency cooperation, which Shannon described as “overwhelmingly inadequate”. Gardaí who spoke to Shannon over the course of his audit told him Tusla does not routinely provide feedback or updates to them following the handover of the child’s care, be it to foster care or back to their parents or guardians. He told the Oireachtas Committee: “The audit found poor inter-agency communication and co-operation. It found inter-agency co-operation overwhelmingly inadequate. It is essential that children do not slip through the net and get lost. It is essential to pull them back from the brink… That co-operation exists, if at all, within the higher echelons of the individual organisations and bears little reality at the coalface. The report highlights a case where a Tusla employee raised child protection concerns with the gardaí just before 5pm on a Friday evening. As Tusla did not provide any out-of-hours service there, it was up to the gardaí to attend the scene and choose whether or not to exercise their Section 12 powers and remove the child from the home. Shannon said such situations could be prevented from reaching crisis point sooner. Fellow Independents4Change TD Mick Wallace went stronger on Tusla. He said: “While Section 12 is very much linked to policing, we cannot unlink it from the role of Tusla given that these children are very often transferred to its care. Is Dr Shannon happy with the performance of Tusla? He might think it is a bit strong, but is Tusla fit for purpose? Shannon said that he would ideally have a child protection system that functions 24 hours a day, seven days a week. He said: “I have confidence in Tusla… I agree with [Wallace's] vision of the out-of-hours service. There may be differences between myself and Tusla on what is our vision. However, my vision for an out-of-hours service is that every child in this country should have access to an out-of-hours service regardless of where he or she lives. Tusla has stated publicly that there is a full service in four counties. My view is that the service needs to be available throughout the country. Otherwise it becomes a geographical injustice in that the service one receives is dependent on the area in which one lives. Another core problem in child protection was the recording of information on Pulse. Shannon found that some data was deficient, and some was not there at all. Sinn Féin’s Donnchadh Ó Laoghaire also expressed concerns about the issues that had been raised from Pulse. He said: “I may be misunderstanding this but it seems to me there is a gap which potentially is putting children who were at serious risk of abuse at further risk and creating a situation where the Garda, social services and Tusla are unable to pick up that thread. That is a significant concern and highlights the seriousness of the deficiencies. While Dr. Shannon has recommended improvements, the Pulse system is clearly not fit for purpose from a child protection point of view. “When it came to Pulse, it was quite clear that there was a problem with it,” Shannon said. “I found that the Pulse system is inadequate. There is no doubt. Whether that is replicated throughout the system or is symptomatic of broader problems with the Pulse system, what I found is that if I had relied on the Pulse data as a basis for this research I would have struggled to make conclusions. I wonder whether the conclusions I would have arrived at would have been accurate. When it came to recording instances of a Section 12 order being exercised, he found that there would be differences between individual gardaí on how much or little detail they recorded about the incident on Pulse. He said: “In terms of the Pulse system as it currently exists, there are very rich narratives by some gardaí and then far less detail by other gardaí. The concern would be around accountability and whether there is a reluctance to put in a detailed narrative because of issues around accountability and a fear of being held to account if they say too much. That is understandable, but we need to have a system now that mitigates against that. The garda spokesperson said that the force would be consulting with Shannon over the next few months to ensure his recommendations are implemented. The spokesperson said: “An Garda Síochána in cooperation with Tusla are in the process of developing a model of inter-agency working which will meet the standards expressed in the report. Email “Author of damning report on gardaí's child protection record invited to train new recruits”. Feedback on “Author of damning report on gardaí's child protection record invited to train new recruits”.